So what is a spray tan and how does it compare to other tanning methods? A spray tan is really just the act of spraying a chemical mixture on your skin that temporarily "stains" the skin to a different shade or color. The coloring from the chemical stays on the outer layers of the skin and is removed as the skin sheds. The normal shedding cycle for the epidermis is around 40-60 days (depending on if you use tretinoin or not) so therefore spray tans can only last at the most that amount of time. Realistically they don't last quite that long because other factors increase skin shedding such as bathing, exfoliating, cleansers and so on . You can compare this method of tanning to other methods of tanning such as a "natural" tan from a tanning bed. In a tanning bed your body is being exposed to ultraviolet light from the lightbulbs in the bed. This ultraviolet light triggers the production of melanin which is the natural pigment in your skin. In response to this light your body produces more melanin which then confers that characteristic browning of the skin that everyone wants! By the way, this is the same reaction that occurs when you exposure your skin to natural sun outside of a tanning bed! The main difference is that we can't exactly create the same ultraviolet light that the sun produces which is why prolonged exposure to certain types of tanning bed may cause long term skin damage. But now that you have an idea of how a spray tan works and why it's different from other tanning methods we can talk about the specific reasons you may want to get a spray tan. Spray tanning has some potential benefits that are unique to this method of obtaining a tan. When determining if you should get a spray tan make sure to evaluate both the positives and the negatives of this particular method. Like anything which method you use largely depends on your preferences are your situation! I personally like to use spray tans for certain special events, but I also prefer to get a natural tan (from natural sunlight) in between to keep up my tan. This is just my preference but each person may be different! The first reason is that getting a spray tan is incredibly fast and efficient. You can schedule your time, walk in, and walk out with a tan that is optimized for your skin in less than 30 minutes. You can compare this to natural tans from natural light which may take weeks to months to create! Even a tanning bed with artificial lights will take weeks to obtain the right glow. This makes getting a spray tan optimal for people who either don't want to spend the time to optimize their color or because they have a special event. Spray tans are great if you have a wedding, want to go on vacation or have some other special event in your life. You can get a perfect tan in 30 minutes that lasts for several weeks just in time for whatever event you have going on. Another huge benefit is that spray tans may actually save your skin. You have to remember that the sun (and this includes both artificial light and light from the sun) cause slightly damage to the skin which then stimulates the melanin response. This process actually DAMAGES the skin! What you may not realize is that this process results in something called photo-damage. And photo-damage is the #1 reason for aging skin among ALL people. This process is one of the reasons that you see dermatologists and medical aestheticians basically avoiding the sun at all times. They do this to try and save their skin. Photo-damage results in a reduction in collagen and elastin both of which are critical to maintaining the integrity and youth of your skin. Getting a spray tan can save your skin because you avoid the potential damage of the sun. This can be a double-edged sword, however, because some sunlight is important for vitamin D production (which we will discuss below). Ever wonder why bodybuilders (both women and men) always get spray tans before competitions? It's because it highlights lean muscle, tends to hide fat tissue and actually makes you look slimmer! You probably intuitively know this, but maybe you didn't realize it is a potential advantage to getting a spray tan. If you plan on going to the beach and need a "base tan" or have some sort of special event like a wedding then it may be in your best interest to look and feel great. Yes it is a fake tan, but you can boost your self confidence and help yourself look great and feel great in your own skin. This benefit isn't unique to just spray tans, by the way, but the difference is that you can get this benefit with a spray tan within 30 minutes while it may take weeks to months to get it from other tanning methods. A spray tan can give you a near instant result in a short period of time. The time it takes to get the tan doesn't mean it's the best option, but it should certainly be considered if you are in a pinch for time! Imagine leaving on a vacation in 2 weeks, there's just no way that you can get a tan in that amount of time with a tanning bed or with natural sunlight. This benefit is not unique to spray tans (you can get it with a tanning bed as well) but it is still beneficial. You can pretty much get a perfect tan any time of the year if you choose to get a spray tan. During certain months the sun is at an angle which effectively causes ultraviolet lights to bounce off of your skin and reduces the effectiveness of natural light. During other months out of the year the sun may be overcast or simply not come out (such as winter). This makes getting a tan by natural light really only an option during summer months (depending on where you live). If you live in somewhere like Hawaii this isn't a problem, but if you live anywhere else then it is something to consider! You can still take advantage of this with a tanning bed as well, but perhaps at the cost of your skin in the process. Another advantage to getting a spray tan is that you have more control over the color and shade of your tan. The more tanning bed sessions (or sessions that you lay out) the deeper and deeper the shade and color of your tan gets. This progression of shading on your skin takes time and can be difficult to control. If you miss a week then it's like taking 2 steps forward but one step backwards. This means that if you want to control the shade using other tanning methods you really need to be consistent and stay on top of your schedule. 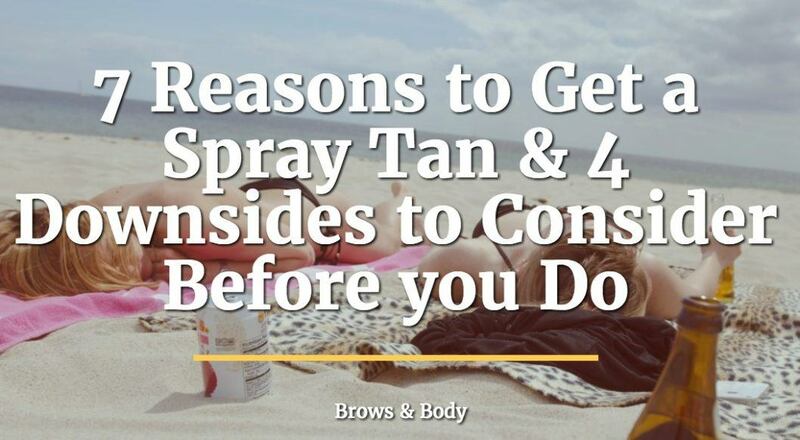 You don't have to worry about any of this if you are getting a spray tan because you can control the shade and color of the tanning solution BEFORE you even start. This means that you can basically "pick" your shade and you end up with the exact color and shade that you want within 30 minutes. Notice skin types I and II on the Fitzpatrick scale. If you have these skin types there is VERY little chance that you will ever be able to tan with natural light or through a tanning bed. In fact, using these methods may even increase your risk of skin cancer because your body may not be able to respond and protect itself with sufficient melanin production. Those who have Fitzpatrick skin types I and II make great candidates for spray tanning because they really don't have any other options. Other skin types can still get tans but their tans may not be as uniform and may not get exactly to their desired shade with sunlight or tanning beds. While there are definitely some serious benefits to getting a spray tan, it's not necessarily for everyone! Before you get a spray tan make sure you understand the procedure including the downsides and potential negative aspects. The first downside is that by avoiding sunlight and ultraviolet light you risk getting vitamin D deficient. Vitamin D is a seriously important vitamin that helps balance your mood, control your immune system and much more. Low vitamin D has been linked to developing autoimmune diseases and other diseases states so it's an important factor to consider. I've seen the argument that Vitamin D shouldn't even be considered in getting a spray tan because most people get sufficient Vitamin D from foods sources. This is technically true but it actually doesn't help. The Vitamin D that you get from foods is in the form of Vitamin D2 and in order for Vitamin D2 to become active and useful in the body you must activate it to Vitamin D3 through sunlight. So even if you do consume Vitamin D2 in food then you still NEED the ultraviolet light from the sun. But it's also worth considering that you can take Vitamin D3 in supplement form and by mouth, but it's probably not as good as getting your Vitamin D directly from the sun. The bottom line is that if you avoid the sunlight in favor of getting repeated spray tans then you may increase your risk of developing Vitamin D deficiency. Another potential issue is the real risk of staining your clothes while getting a spray tan. This isn't a deal breaker though, especially since you can actively avoid this issue by being cautious - but it is still worth considering. The spray tan chemicals are designed to STAIN your skin, so they will stain clothing or other things they come into contact with. The reason that the chemicals are shed from your skin is simply because your skin sheds over time, but this obviously doesn't happen with your clothes. So be careful when you get a spray tan to avoid getting it on your clothes or personal items! Another downside is that while spray tans work absolutely great, they don't last very long. This means that you'll need to spend both time and time with some regularity if you want to keep up your results. Natural spray tans and tans from tanning beds tend to last longer than the tan you get from a spray tan. This isn't a huge deal if you only occasionally get a spray tan, but it can become an issue if you try to keep up your tan exclusively through this method. You can count on your spray tan looking really good for about 5 to 10 days, but after that point it will start to fade rapidly from your skin. Natural sun tans and tans from tanning beds tend to last weeks to months (though they do fade over time). Another factor to consider is that you will be up close and personal with someone in order to get your spray tan. This means that you will be in a 1 on 1 setting and exposed in order to get your tan! Compare this to a tanning bed in which you are alone in the bed by yourself while you get your tan. This means that getting a spray tan is not necessarily a "relaxing" experience. It probably isn't an issue if you are outgoing or don't mind that sort of thing, but if you have a shy or reserved personality make sure to consider it! Because you are putting chemicals on your skin it's natural to ask if the procedure is safe. The answer is that the vast majority of the time most people won't experience any bad side effects from getting a spray tan. Some people may react to ingredients or chemicals in the spray tan mixture, but these people are those who tend to react to EVERYTHING and are very sensitive to medications, supplements and so on. While this is a rare reaction it's often worth considering. Another way to fight this reaction is to simply use organic based ingredients which are less likely to cause any real problems but still provide your body with a nice tan. Natural ingredients such as turmeric can stain your skin various colors and may actually be HEALTHY for your skin. I personally recommend that if you do choose to get a spray tan that you stick to organic materials because not only is it healthier but you will reduce your risk of a negative reaction to the ingredients. Remember that your skin is the largest organ in your body. Your skin naturally serves as a barrier to prevent unwanted things from entering your bloodstream but the skin can't keep everything out. If you put any chemical or ingredient on your skin just realize that SOME of that product will be absorbed into your bloodstream (though probably not a lot). This method of absorption is known as transdermal absorption and it should be considered before you put anything on your skin. If you do decide to get a spray tan you can take several steps to help improve the quality and longevity of your results. There are some things that your artist may not tell you but that may help your tan last longer. Exfoliate BEFORE you get your spray tan - The idea here is to reduce the chance that your body will exfoliate after your tan. Remember that the way the spray tan works is by applying a stain directly to your skin, but also remember that it fades because your skin sheds. If you can reduce the chance that your skin will exfoliate early then it should increase the length of time that the tan lasts. AFTER your spray tan avoid wiping your skin - The logic here is that the ingredients are just on the superficial or upper layer of your skin. If do a wiping motion to dry off your skin with a towel after your tan you risk increasing exfoliation and also expelling the stain from your skin quicker. You can avoid this by simply patting yourself dry after a shower or a quick pool dip instead of wiping your body clean. By following these tips you can increase the length of time that your results last. ​CONSIDER what you wear (or don't wear) during your spray tan - You will want to consider what to wear (or not) when you go into get your tan. It's not uncommon for people to prefer to go naked into their spray tan! Going naked reduces tan lines and gives a perfect even tan throughout the entire skin. If you don't want to go naked that's not a problem either, just make sure that you wear an OLD swim suit that you don't mind getting stained. PROTECT your nails during the spray tan - Just like your skin your nails and nail beds can get stained by the ingredients of the spray tan. You can avoid this by simply putting a coat of nail polish on your nails before the procedure. Most spray tan locations will wipe off your nails but you can also come in prepared. PROTECT the palms of your hands and soles of your feet - When you get your spray tan you want to make sure that your tan looks as natural as possible! That means avoid getting a "tan" on places that shouldn't normally be tanned. This is most obvious on the palms of your hands and the soles of your feet. You can avoid getting "tanned" in these places by placing barrier cream on those locations before the procedure. Most spray tan locations will automatically provide this for you, but just make sure you consider it before going in! If you follow these tips you will be ready to get your spray tan! If after reading all of this you decide to get a spray tan you are still in good company! In my experience those who do the best with spray tans are those who get them for special events and for situational circumstances. When it comes to keeping a nice glow all year round you are probably best off by using natural sunlight (if it's available to you) and minimizing your time in the sun to prevent long term photo-damage. Are you thinking about getting a spray tan? Are you concerned about the ingredients or how it works?